The 122' Fitzroy/Whangarei completed 7 world circumnavigations! : Atlantic Yacht & Ship, Inc. The 122′ Fitzroy/Whangarei completed 7 world circumnavigations! It’s time to remember what it’s like to feel alive. Are you ready for your journey? With a light ice re-enforced hull and the engines rebuilt February 2018, “Kahu” is ready to go anywhere. The motor yacht “Kahu” was originally built as a New Zealand Navy “MOA” class vessel by Whangarei Engineering & Construction Ltd. Furthermore, she was rebuilt, lengthened, and re-purposed as a long range expedition yacht by Fitzroy Yachts in New Plymouth, NZ in 2012 for a family with sites on exploring the world. Logging thousands of miles, the current owner has enjoyed several trips throughout the Bahamas and the Northeast Coast of the United States. After all, completing 7 world circumnavigations in her life time. Her draft is under 8 feet allowing her to safely access shallow areas. Together with, her heavily constructed steel plate and frame allowing her to handle light ice conditions. Equally important, a complete refit to the interior including new carpet, lounges and main saloon furniture in 2016. Enjoy large windows throughout the vessel providing natural light to each space. For a full list of recent updates, check out the 122′ Fitzroy/Whangarei listing details. 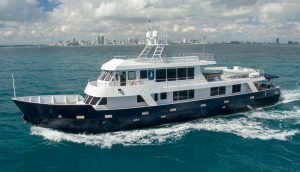 For more information on the 122′ Fitzroy/Whangarei contact Joe Marino or Bryan Carter at Atlantic Yacht & Ship, Inc. today. “Seas the Day” with this 80′ Sunseeker 2010! US Flag – Duty Paid!